Udo’s Choice Children Blend Microbiotic is formulated with a viable count of eight specially chosen bacterial strains especially beneficial for a child’s healthy intestinal flora. Guarantees 5 billion viable cells* that are absolutely essential for proper digestion, strong immune function and over-all health. (*at time of manufacture). Formulated to include the bifidobacteria B.bifidum and B.breve essential for the healthy development of a childs digestive tract. Microbiotics are the beneficial, friendly bacteria that occur throughout the digestive tract. Poor eating habits, chlorinated drinking water, stress and disease and the use of antibiotics in food production as well as in medical treatments can wreak havoc in the gastrointestinal tract by destroying good bacteria and allowing undesirable bacteria to multiply. Why do we need Microbiotics? When the ratio of good bacteria to bad is lowered, problems begin to arise such as excessive gas, bloating, intestinal toxicity, constipation and poor absorption of nutrients. Whilst it is true that non-beneficial bacteria are naturally occurring in the intestinal tract problems begin when their growth goes unchecked. Microbiotics play an especially important role in keeping in check the pathogenic bacteria that cause disease. A healthy lower intestine should contain at least 85% friendly bacteria to prevent the over colonisation of disease causing micro organisms like E.coli and Salmonella. A childs healthy microflora will closely resemble that of an adult but due to their smaller size children need much smaller quantities of the same bacteria. The specific strains used in Childrens Blend have been specially chosen for their value to childrens health and have been formulated to the viable count appropriate for children. Lactobacillus plantarum a strain from vegetal origin, is another major species found in the intestinal tract. It secretes the natural occurring antibiotic lactolin and has beneficial anti-microbial activities. This microbiotic is being studied for its efficacy against allergies and Irritable Bowel Syndrome (IBS). Bifidobacterium breve colonizes the large intestine and is a producer of lactic and acetic acids that inhibit the growth of undesirable bacteria. It enhances immune responses against various pathogenic antigens and has been shown to repress the growth of ulcer-inducing bacteria. Recent studies have demonstrated that B.breve can colonize the immature bowel of infants very effectively and is associated with better weight gain in very low birth weight infants. Lactobacillus fermentum has a wide variety of applications including food fermentation. Some strains of Lactobacillus fermentum have a natural resistance to antibiotics and have been associated with cholesterol metabolism. In a base of Ascorbic Acid, Hypromellose, Potato Starch, Silicon Dioxide and Steric Acid. Consume 1 to 3 capsules per day after eating to help build up good intestinal flora. Food supplements should not be used as a substitute for a varied diet. Store out of reach of yound ghildren. Not suitable for children under 4. Refrigeration ensures maximum potency & stability. 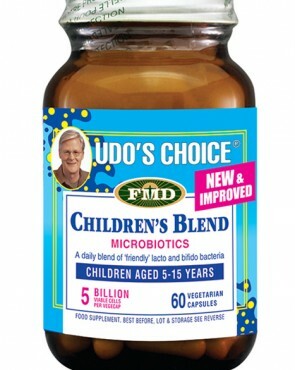 Udo’s Choice Children’s Blend Microbiotics can be left unrefrigerated for short periods of time and may be frozen.